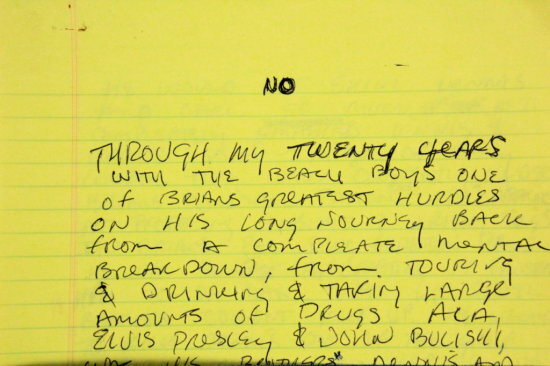 The Beach Boys Brian Wilson Handwritten "Lost" Personal Memoirs (Mentions; Drugs,Elvis,Family & SO MUCH MORE) - These documents (as there are several handwritten pages) discuss Brian's most personal feelings about being in The Beach Boys. He also discusses his feelings about the beginning of his carrer, the cruel treatment from his father, his brothers and a scandal related to Elvis Presley. These documents have never before been seen, and were found in the dresser drawer of a piece of furniture purchased at an estate sale in Lake Oswego, Oregon. The estate belonged to Milton Love, who is the father of one of the most famous Beach Boys, Mike Love (AKA Dr. Love). We will not be showing photographs of the documents to maintain their value as "Unreleased". These items were never meant for release, as the family always assumed that someone had cleaned out the drawers of the dresser prior to selling it. The Beach Boys are America's biggest band, and are rock n' roll legends. This is a once in a lifetime opportunity to own a legendary piece of iconic history. We have only photographed the top header of the document, as the new buyer will be the owner of the document and will have the choice to release it, or not. There has never been anything like this offered at auction. We have personally spoken with a representative for The Beach Boys, and they confirmed that this is part of the "Milton Love Lost Collection." All photo negatives, and documents are available for private viewing (by appointment only), you may schedule an appointment by emailing: Brigitte@gwsauctions.com. All previews will require a signed "Non-Disclosure" prior to viewing. Payment Instructions: You can call: (760)610-4175 to make payment or you will receive a separate invoice,that will allow you to pay online. Everything MUST be paid for in full with in 48 hours of the end of the auction. Bidder further agrees that under no circumstances will he/she initiate a charge-back on his/her credit card. A 35% reselling fee will be applied to items not paid in full by the Tuesday following auction NO EXCEPTIONS. Wire transfer will be required on all purchases over $5000.00. We will also provide a 3% "cash discount" on all transactions if you choose to do a wire transfer. We will also provide this cash discount if you mail in a cashier's check (no personal checks please). All cashier's checks must be received by the Tuesday following the auction. Payment in full must clear prior to shipment of items. Shipping Instructions: BUYER PAYS ALL SHIPPING & PACKAGING MATERIAL COSTS--WE DO IN-HOUSE SHIPPING (WE ONLY SEND OUT LARGER, OR FRAGILE ITEMS TO AN OUTSIDE SHIPPER).We will combine shipping on multiple lots for our winning bidders. Shipping insurance and signature confirmation is required on each package at buyer's expense. All items will be shipped within 4-6 (BUSINESS) days of the auction, ONLY IF YOU HAVE PAID YOUR INVOICE WITHIN 48 HOURS. IF YOU MAKE A LATE PAYMENT YOUR SHIPPING WILL BE DELAYED UNTIL THE NEXT AUCTION. In the event that you need to make a claim with FedEx or USPS you will need to complete the following: 1) KEEP THE BOX, ALL PACKING MATERIAL & THE DAMAGED ITEM (INCLUDING ALL BROKEN OR DAMAGED PIECES). **IF YOU THROW AWAY THE BOX AND PACKAGING FEDEX WILL DENY YOUR CLAIM. We do in-house shipping. All packages will require signature confirmation, tracking & insurance.